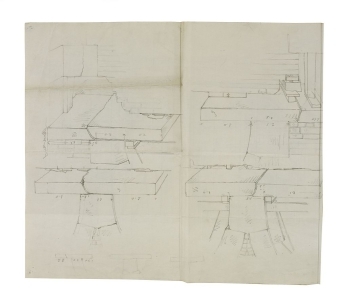 Drawings 14 and 15 (though the former is undated) appear to be early, site records of Taylor's inverted arch foundations. The decaying state of these foundations was one of the reasons for Soane's rebuilding of Taylor's south and south-east Transfer Offices. Inverted foundation arches were an inexpensive method of providing strong foundations where a great weight was to be placed above. The more expensive method involved driving piles deep into the ground and it would have been impractical for Soane to alter the method of construction. Inverted arches counteracted the forces working on them from above, carrying the strain inwards to the centre, rather than directly down through pier to base-foundation. The key stone of the inverted arch acts in the same way as a normal arch, taking the pressure. Many of Taylor's foundations, however, were redundant, given that Soane intended to use four (central) piers, rather than the 16 Taylor had required. Drawing 15 may have been made either by Charles Edward Papendick (1801-1835, pupil 1818-1824) or by H. Parke (1790-1835, pupil 1814-1820). As mentioned in the notes to drawing 12, the initials appear to be 'CP' which would suggest Papendick, except that he did not begin as a pupil in Soane's office until 1818. The Day Book for the 24 December 1817 records that H. Parke was 'making perspective sections of a design for the new 4 per cent office' on this day. It may be that either the date or the initials were confused or badly written.